As the European carbon price continues to languish below 5 €/t, France has decided to take action. The French government announced in April that it would follow the UK in unilaterally implementing a carbon price floor targeted at 20-30 €/t. Subsequently in July, an advisory committee commissioned by the government released a report with a strong recommendation to implement a domestic mechanism to increase the carbon cost for coal plants. France’s unilateral action reflects its frustration at the absence of any meaningful European initiatives to strengthen carbon pricing. But unlike the UK, France is also focused on spurring other European countries into action in an attempt to build some momentum behind the COP21 agreement. The French government are actively promoting the idea of a EU wide ‘carbon price corridor’ to maintain an ETS carbon price above 20 €/t from 2020. The French are right in challenging the status quo. The European ETS carbon price signal has spent the last three years hovering around 5 €/t, a level which is essentially meaningless for inducing significant emissions reduction. But the impact of implementing a price floor in France versus more broadly across Europe are two very different things. In this article we explore the impact of (i) higher carbon prices in France and (ii) higher carbon prices across Europe, focusing on the potential impact of these scenarios on power market pricing and asset value dynamics. The French government initially proposed a uniform carbon price floor to operate on a ‘top up’ basis, similar to the existing UK carbon price floor. In other words a defined domestic price premium would be added to the EUA ETS price. However, a French government advisory committee, which reported back in July, recommended an alternative approach to specifically target and penalise coal (to incentivise a shift to lower carbon intensity gas-fired generation). This could either be done via an increase taxation on coal-fired power plants or by imposing tighter carbon emissions standards. The French environment minister, Ségolène Royal, has not yet made a formal policy announcement but has reiterated the Governments commitment to introduce some form of domestic policy measure from January 2017. Royal has also indicated that France will propose that Europe introduces a European ‘carbon price corridor’ that will allow EU nations a degree of flexibility to set their own carbon pricing terms within a broader European framework. The current French proposal is for a European carbon floor price of between 20 €/t and 30 €/t in 2020 with annual increases of 5 – 10% with a target of 50 €t by 2030. The proposed price ceiling would start at 50 €/t in 2020 and increase at a similar annual rate to the floor price. 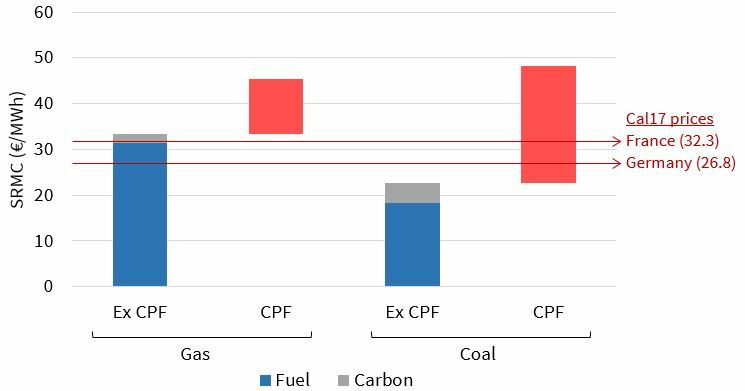 The primary effect of a uniform carbon price floor policy would be its impact in increasing the variable costs of coal and gas fired generators. Chart 1 illustrates the incremental cost increase for a CCGT 50% HHV and a coal plant 40% HHV. This will clearly have an adverse margin impact on French thermal generators, particularly coal plants. However an attractive aspect of implementing a carbon price floor from a French perspective is that it is likely to have a limited impact on wholesale power prices. This is because domestic thermal (coal and gas fired) power plants play a relatively small role in setting marginal prices in the French market. France has low installed volumes of coal (3GW) and gas (6.5GW) fired generation capacity. And the pricing impact of this capacity is limited, given interconnector flows play a dominant role in setting French power prices, particularly on the German border. The carbon price floor is most likely to impact winter and peak prices when French thermal plant can influence marginal power prices. The policy should have little impact on summer and offpeak prices which are currently driven by coal priced imports from Germany. If France imposes a carbon price measure on coal plant only as recommended by the advisory committee report, then the wholesale power market impact will be even more muted. One of the reasons the committee made this recommendation was to prevent the closure of gas-fired plant required for security of supply. Gas plants would benefit from somewhat higher load factors if the government pursued a coal only carbon charge. Any increase in domestic (or neighbouring) power prices will be warmly welcomed by the French nuclear giant EDF, given this will flow straight to the bottom line of their nuclear power portfolio. The benefits of the price floor policy for EDF may not be a coincidence either. The French government owns a majority stake in EDF and is in the process of raising capital to support the utility’s nuclear development ambitions. Increasing wholesale power prices would certainly help to ease EDF’s balance sheet issues. Possibility of a broader European roll out? The French push to implement broader carbon price support across Europe is likely to come up against much stronger headwinds. But if successful, it would also have a more meaningful impact on wholesale power market pricing dynamics. Germany is key. The German electorate is certainly open to proactive environmental policy. But given coal plants dominate wholesale price setting in the German power market, higher carbon prices will be passed through directly into higher wholesale prices. German policy makers are already contending with a strong industry lobby pushing against the impact of renewable support in raising power bills and eroding German competitiveness. This lobby is unlikely to welcome measures to support a higher carbon price. The strong German coal and lignite industry lobby will also be hostile. However the German Energy Ministry so far appears to be at least engaging in a conceptual discussion of a policy shift to support to a minimum carbon price, even if so far it is from behind closed doors. Several other European countries may be open minded in considering implementation of a carbon price support policy (e.g. Ireland, Netherlands, Belgium, and Norway). The degree to which carbon price support gains traction across other EU nations will likely be an important factor in influencing the German debate. What does a broader price floor rollout mean for power market pricing dynamics? Let’s leave aside the policy debate and focus on the pan-European impact of higher carbon prices. This could be driven by a broader implementation of carbon price support mechanisms or by measures to support the EU ETS price (a much cleaner way of addressing the problem). Short run competitiveness: the relative increase in gas plant competitiveness vs coal on an SRMC basis, supports gas vs coal plant switching (or substitution of gas for more expensive coal plant generation). Long run competitiveness: The erosion of coal generation margins, combined with other regulatory hurdles that coal plants are facing, would likely bring forward asset closure dates. Gas burn: Power sector gas demand in Europe would be positively impacted, by 1. in the short term (given gas for coal switching) and by 2. in the longer term. The UK power market provides a useful case study for implementation of a carbon price support policy. All three factors can be observed in progress. The impact of higher carbon prices on absolute power prices and generation margins is more complicated. This depends on the degree to which carbon prices are passed through via the marginal plants setting wholesale power prices. Chart 2 however illustrates some important upper and lower bounds to consider, based on an example of a 30 €/t price floor in the German power market. Because coal plants have a much higher carbon intensity than CCGTs, the pass through of carbon prices to wholesale power prices is greater when coal plants are marginal (setting prices). But a carbon price floor would also change the dynamics of price setting plant. It would act to push coal plants out of merit, increasingly the influence of CCGTs in setting marginal prices. Higher power prices: The influence of the greater carbon intensity of coal generation feeds through to create a significant uplift in wholesale power prices. 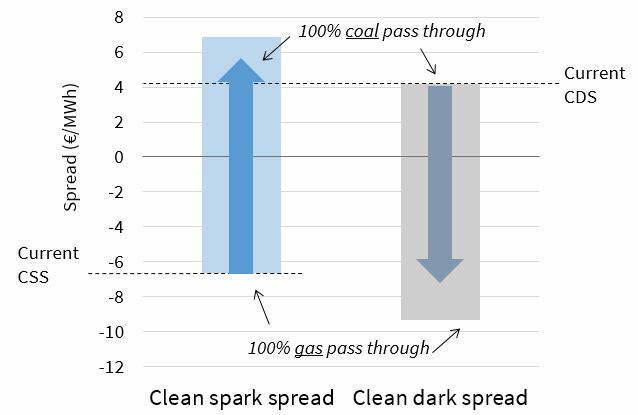 Gas for coal switching: Higher carbon prices act to shift the competitive balance towards gas plants, increasing CCGT load factors and pushing coal plants up the merit order. This to some extent counteracts the impact of coal plant pass through of higher carbon costs to power prices. Higher CCGT generation margins: The increase in power prices acts to significantly increase CCGT margins (given a lower CCGT carbon intensity). A unilateral French carbon price floor is likely to have a limited impact on the European power market landscape. But a floor price implemented in Germany could have a transformational effect on thermal asset generation margins and coal plant closures across Europe.